Rap Genius, the lyrics site that breaks down the meaning behind rap songs, has launched a new project called Poetry Brain.Instead of annotating rap songs, Poetry Brain offers crowdsourced annotations of classic literary texts, poetry, academic papers, and even political speeches. Unlike sites like SparkNotes and CliffNotes, Poetry Brain isn’t looking to do a uniform editorial style, Allen says. Instead, it’s aiming to be more of a collaborative art and annotation platform. “The big difference between SparkNotes and other sites is that it’s a more engaging presentation,” Allen says. 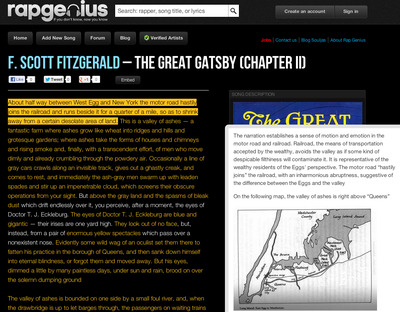 For example, users can annotate the text with multimedia elements like pictures, video, and audio. Another difference is that Poetry Brain doesn’t provide summaries of texts or other shortcuts. That’s because it wants to encourage student engagement by having them read the works of literature in conjunction with the annotations. But since anyone can add annotations, Poetry Brain has editors to ensure the information is accurate. Already, MIT’s literature department is integrating Poetry Brain into its poetry courses this semester. There’s also a handful of individual instructors at other schools, like Williams College, and Johns Hopkins, that have either already integrated Poetry Brain into their curricula or will do so this semester. Professors can assign students texts to read and annotate on Poetry Brain, and then provide edits and feedback. Rap Genius raised a $15 million round led by Andreessen Horowitz back in October to help fuel its growth and expansion into a site that annotates more than just rap lyrics. Right now, Poetry Brain is part of the Rap Genius website, but it will eventually get moved to poetrybrain.com. Here’s an example of PoetryBrain in action. The majority of the annotations were done by a single high school class, Allen says.